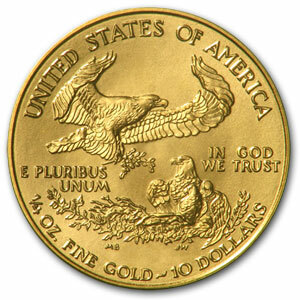 The American Eagle 1/4-Ounce Gold Coin is one of the most popular coins of all. In just one year (2015), the US Mint produced over 122,500 of these coins. That means they’re at a great price now for investors to buy but it also shows you just what a popular, striking design they must feature. If you’re looking to start investing in gold coins, then the American Eagle 1/4-Ounce Gold Coin is perhaps the best place to start. And by choosing the smaller size, you’ll be able to get started with an even smaller initial investment. Let’s take a look at this particularly stunning, popular choice and see why it’s such a smart way to keep your finances secure. The popularity of this coin no doubt stems from its beautiful and highly patriotic design. This is a coin that celebrates everything great about America and that’s a truly rewarding type of coin to own! The American Eagle 1/4-Ounce Gold Coin gets its name from two eagles depicted on one side. One eagle is in flight but is bringing its wings round in front of it into a slightly curled position that makes it look ready to land, or suggests it is just gradually slowing down. Beneath it and to the right is a second eagle, which is sitting in a proud manner and looks very bold and almost heroic. There is also a branch with some leaves and other foliage in the bottom right of the image and together, the image is just dynamic and very inspiring. The words ‘United States of America’ and ‘In God We Trust’ are also included on this side. On the reverse is a depiction of the Lady Liberty. She is found walking toward the foreground, with her arms wide apart and lines radiating from behind as though to indicate a bright light. This is the same image as that found on the famous $20 gold piece printed from 1907-1933 and designed by Augustus Saint-Gaudens. It’s another highly dramatic and inspiring image and the two together are what make this coin so popular. This coin first went into production in 1986. At that time it was a little different however, as it featured Roman Numerals rather than today’s Arabic Numerals. That changed in 1992, giving us the coin that we know and love today. As mentioned, there are well over 100,000 of these coins printed every year, owing partly to that proud and dynamic imagery. It’s also popular for many other reasons however. The coin contains exactly one ounce of gold for instance, which is guaranteed by the US Mint. That means that the value will fluctuate of course, depending on the value of gold at any given time. There’s just a small amount of copper included to enhance durability. The tender depicted is of course just for show, seeing as the value of gold will affect the value of the coin. This is a very good choice for retirement accounts and is very popular in that purpose. However, it is also popular for beginner investors, partly owing to the imagery and partly to the fact that the large number of prints means the premium over spot price is low. By buying this coin in 1/4-oz, you will get it at a particularly good rate and that makes it perfect for those first time investors. When buying, you can receive the coins either in plastic tubes, or in composite red boxes that hold 500 coins. Either is going to help you to store and transport the coins, while keeping them safe and secure. Why Invest in Gold Coin? If you’re going to invest in gold coins, then choosing the American Eagle 1/4-Ounce Gold Coin is one of the very best choices. But why make this kind of investment at all? Simply put, investing in gold is one of the safest ways to invest your money today. With the value of the dollar being unpredictable and more economic uncertainty ahead, gold is one of the best assets when it comes to holding its value. In fact, gold has been shown to be one of the few assets to actually increase in value as the dollar falls. What’s more, is that investing in gold coins means buying individual pieces of gold and actually getting to keep them. This is called ‘direct terminology’ and is different from investing in stocks and shares – or even from investing in gold bars that will stay locked in a vault somewhere. This means you’re not paying for the privilege of someone looking after your gold and better yet, it means that you actually get to hold on to the coin and enjoy it in person. This is such a stunning piece of American history, that that truly is a great perk.